When we arrived in germany the temperatures were not excactly summer like. However, that changed over the course of the four weeks. Luckily there is plenty of “summer wine” available, young wines with low alcohol levels which excite the palate also of the non-wine drinker. Nothing is better fitting a barbecue than a nice and clean rosé wine. 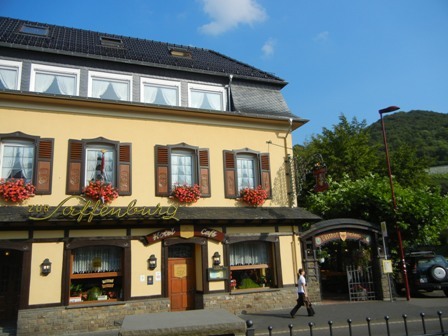 My friend Josef’s main house wine producer is the winery of Rudolf Hoffmann in Detzem, Mosel. This is partly because vintner Hoffmann has leased some of his vineyards from the Arnoldi family, and my friend Josef is married to an Arnoldi girl. Both love to drink wines made from the vineyards which were once cultived by the parents and grand-parents. 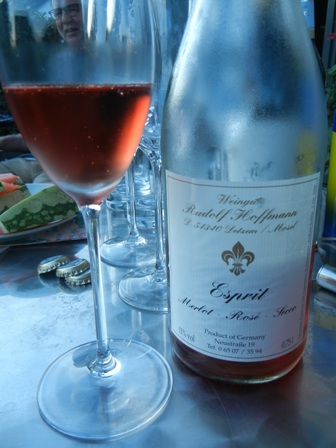 And here we are with a ‘2010 Esprit Merlot Rosé’ by Rudolf Hoffmann from Detzem, Mosel. 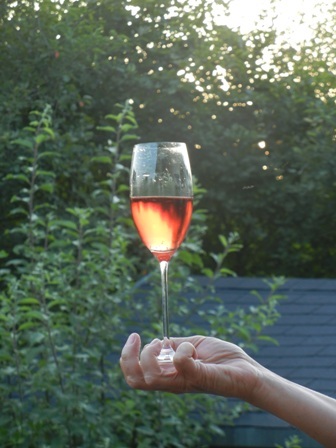 This is exactly how you want a rosé to be. The Merlot’s fruitiness is here a bonus as well as the alcohol of only 11%. I suggest: drink more of this type of Mosel wine. If German summers would just be a bit warmer…..
Well, if you could just see around the bend in the river, you could see Assmannshausen and its steep vineyards. The vineyards you see in the distance on the other side of the Rhine river here in the photo above are in fact the ones of Ruedesheim. However, you will get a good idea how steep these terroirs are and what a hell of a lot of work it is to cultivate the grapes on these steep slopes. 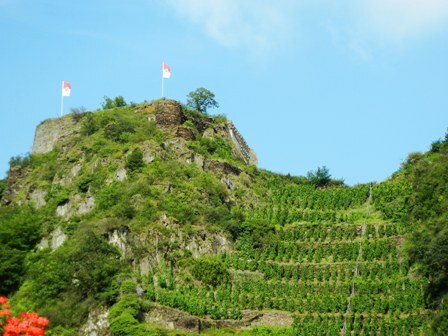 ‘Hoellenberg’is the name of the location (terroir) which means in English (freely translated) ‘mountain of hell’, a quite common name for steep slopes in the Rheingau wine region. 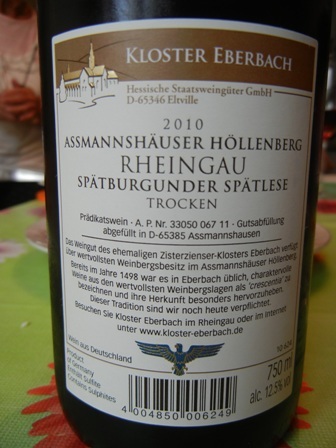 In short, the best Pinot Noir (spaetlese, late harvest) I tasted during my five weeks in Germany was a ‘2010 Hoellenberg Pinot Noir Spaetlese’ from Assmannshausen produced by Kloster Eberbach in the Rheingau. 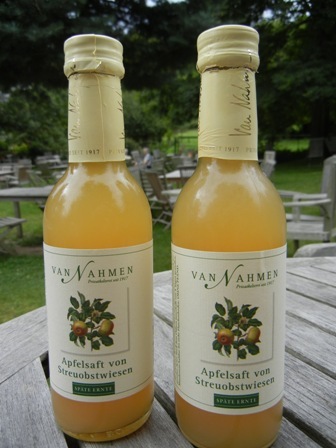 I bought the bottle in the wine shop at Kloster Eberbach for about 17-18 Euro, I think and it turned out to be a treasure. Pinot Noir of the finest kind. Pinot Noir the way I like it, full of flavours but well balanced, earthy with a vibrant acidity, a good body, structure and a long finish. A wine with character. At 12.5. % alcohol, this wine is not overpowering but elegant, regal I would even say. I immediately regretted that I had not bought more bottles. I was to fast, as always, impatient. At the time I did not want to stand in line for the tasting on this busy Sunday afternoon when we had dropped in the cellar door at the monastery in Eberbach. 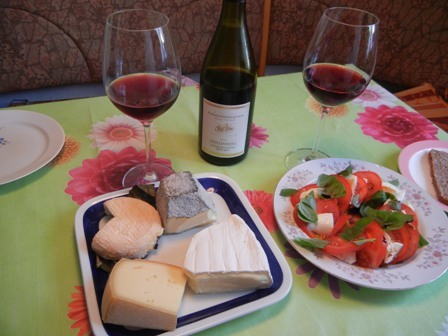 We had the wine in a very casual way with some summer dishes, salads and typical German dinner cold cuts and an insalata caprese. The wine would have matched almost any food except some spicy Asian dishes. but it is worth being enjoyed as stand alone drink. My rating: four and a half out of five stars, 19 of 20 points, 90 Parker points. I could not be more subjective, I guess. In hindsight and given my memory lapses, I consider this the best wine I drank during my summer vacation. 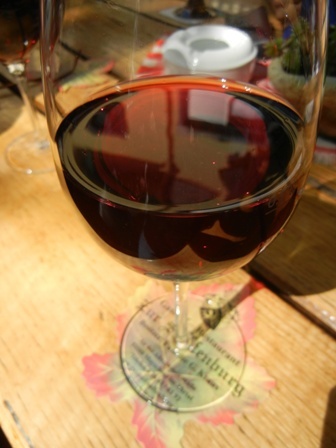 The only one exception maybe was the wine tasting at Karthaeuserhof in Eitelsbach which I attended at the last day of the holiday, but then we merely tasted (small amounts of excellent wines in big glasses and without food) and did not drink a bottle of wine. More about this event, another time. Stay tuned to the Man from Mosel River. 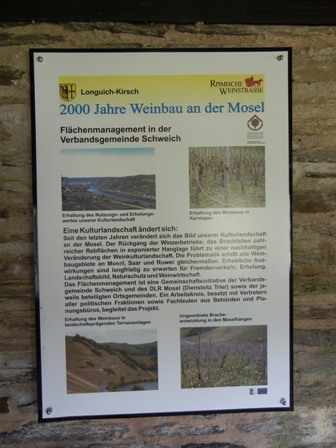 The cultivation of grapes along the Mosel river and its tributaries Saar and Ruwer is more than 2,000 years old. For the Romans wine was an important commodity. 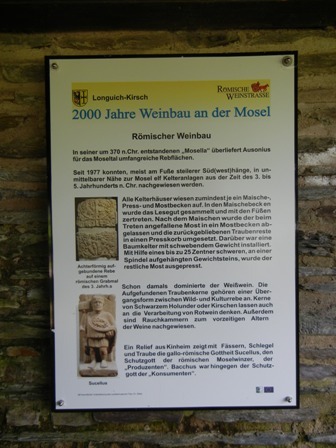 All along the Mosel river one can find traces of the Roman wine industry, among them wine presses and fermentation tanks, vineyard implements, residues of grapes, statues of gods and godesses etc. 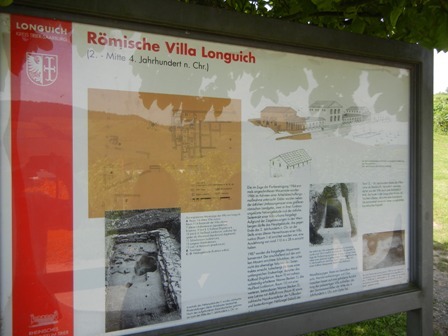 Among the treasures are the ruins and foundations of many Roman rural villas. One of them can be found in Longuich-Kirsch, just a few kilometers downstream from my hometown Trier. Various types of these villas can be distinguished. Some of them contain large mosaics as the villa in Nennig. The villa in Longuich is a “villa urbana”, the seat of a retired high official. It is very large (110 x 28 meters). 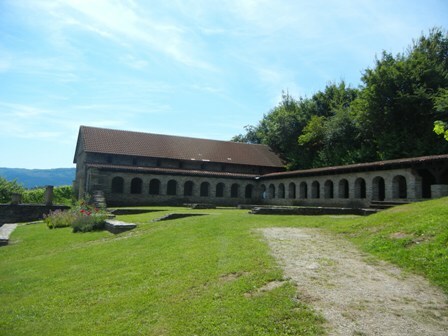 It was built in the 2nd century after Christ and includes an extensive Roman bath consisting of a Caldarium (hot bath), Tepidarium (warm bath), Sudatorium (sauna), Frigidarium (cold bath) and Praefurnium (fire and heating system). 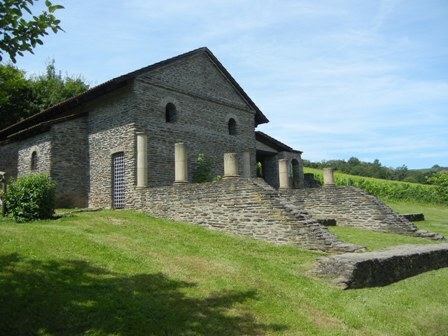 The foundations of the villa were accidentally discovered during land consolidation and reconstruction work in 1984. Next to the villa some agricultural buildings we found as well. The villa urbana was restored and is today open to the public. 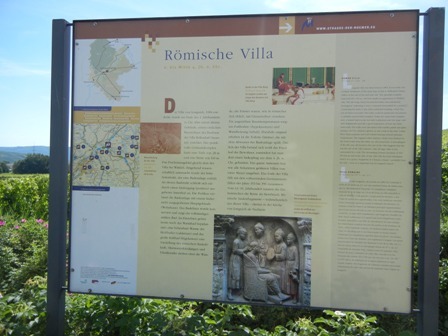 Various billboards inform the casual visitor about various aspects of roman life including the two thousand years of grape and wine production. Imagine that so long ago people were working in vineyards and wineries in the very same places where also todays wine is produced. Amazing. The work was even harder than today, I guess. The production techniques of the Romans are well researched. The billbords explain todays challenges and how they were mastered recently. I loved the way ancient history was linked to contemporary modern life. I highly recommend visiting these villas. The view over the valley and its vineyards is another great experience. 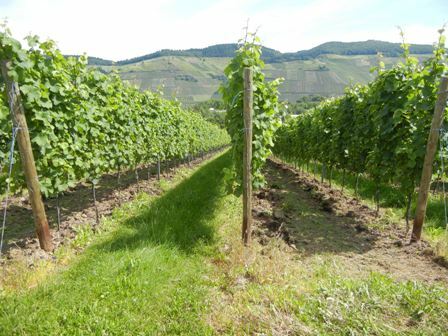 Fortunately, the vineyards in the vicinity of the villa are still productive, and many wineries and vintners are happy to welcome visitors and introduce them to their excellent Riesling wines. Regular readers of my blog will have noticed that I usually abstain from writing negative comments about any wine experience. Today I will break with this tradition making a slight dent in my otherwise immaculate positivism. 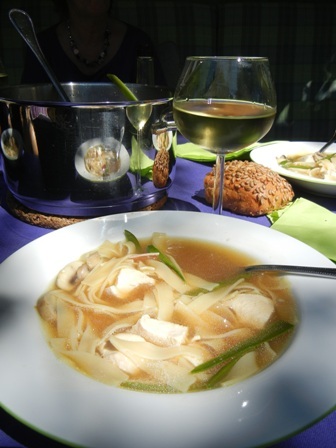 Summertime in Germany is also the time of wine festivals and the time of visiting wineries and cellar doors. 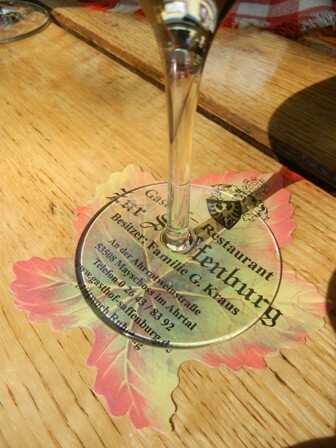 And keeping in the spirit of things, my family and I, we set out on a beautiful day in July to pay a visit to one of the wineries along the Saar river. I needed a birthday gift for a dear friend of mine and I intended to honor him with a first class bottle of wine from a first class winery. 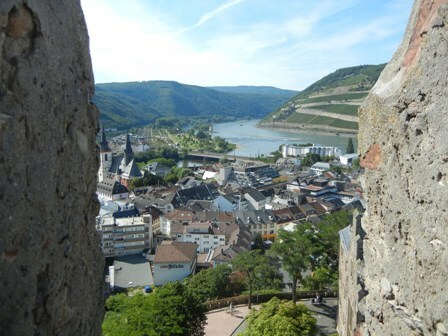 Since my friend lives in the Ruwer valley, a location with excellent Riesling terroir, I wanted to contrast the Ruwer wines with a specimen from the Saar, the other tributary of the Mosel where excellent Riesling wines are produced. 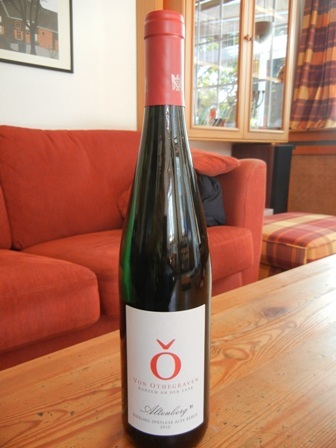 My choice was the Von Othegraven winery in Kanzem, a small hamlet on the banks of the Saar river. This winery is quite well known in Germany because Guenther Jauch, a celebrity TV moderator and talk show host, is the owner of the place. I could not have been more wrong in my choice. 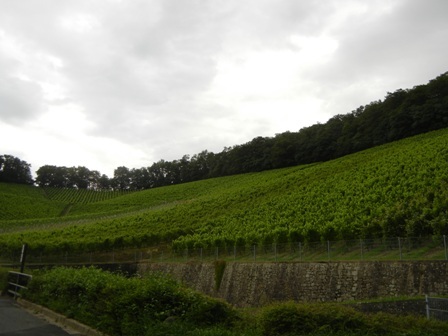 We rocked up without an appointment (which we would regret), drove into the courtyard of the estate at the outskirts of Kanzem at the bottom of the steep vineyards of the Kanzemer Altenberg, the grand cru vineyard of the area. We innocently rang the bell of the manor house but where greeted by a very grumpy vintner (it was the manager, not the wine-maker), who let us know immediately and in a very impolite way that we were not welcome, and should “buzz” off. Uff, we were mentally not prepared for such a rude reception, and deeply regretted that we had bothered to come in the first place. So my recommendation to the casual wine tourist is not to visit Von Othegraven. It is a waste of time. 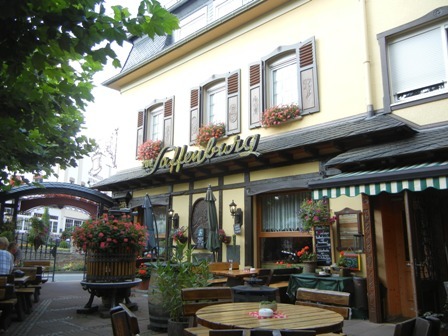 If you are still interested in their wines, go to my favourite wine bar, Weinsinnig in Trier, and buy a bottle of the outstanding Altenberg Riesling. 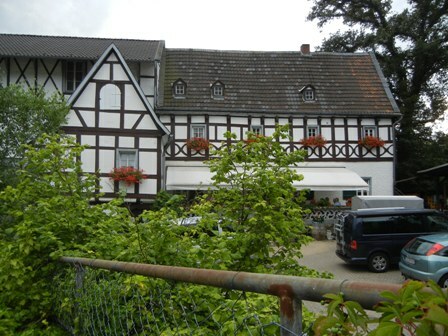 When I was a student at Bonn Univerity and I lived at the right hand side of the Rhein river (they call it the “schael Sick”, the shoddy side of the river), I visited this place in Oberdollendorf regularly. Sometime we would just walk from Niederdollendorf through the forest to get there, sometimes we would cycle along the Rhain river. It was one of our preferred destinations. 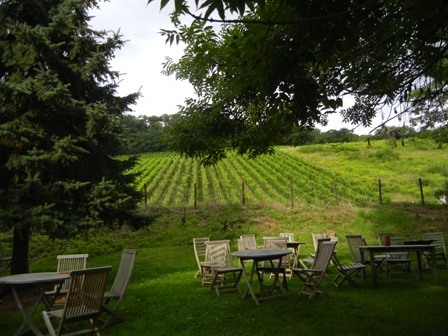 We would relax in the garden and enjoy some bottles of local wine. We came there recently to end our visit to Koeln and Bonn (including a visit to the house of german history). It was the highlight of the day so to speak because my wife and the children had never been there before. I wanted to share with them some of my past. The weather was a bit cloudy, and it was a Thursday, consequently only young and not so young lovers and retirees where there when we arrived. 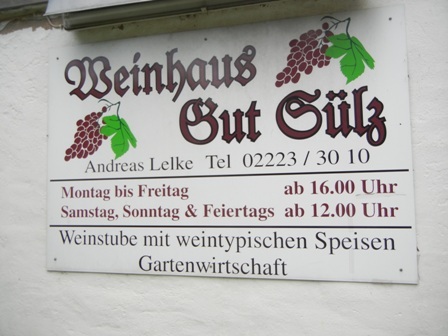 The Weinhaus Gut Suelz is located at the bottom of a kind of natural theater, sourrounded by vineyards with the forests on top of the hills, at the edge of the village. 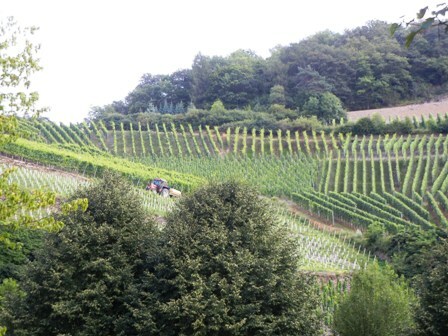 The vineyards, however, do not belong to the ‘Weinhaus’, Suelz does not have it’s own production. But I knew one of the vinteners of these vineyards, the Bloeser family. Indeed I have written about them years ago on the Man from Mosel River. I did not fancy a Riesling but instead wanted something special, something local. The Blauer Portugieser (in France known as Portugais bleu), a traditional grape variety from Austria (yes, Austria and not Portugal) wine seemed just the right stuff. It is a light, but dark red wine, with a medium to light body, soft tannins and low acidity, an uncomplicated wine one could say. 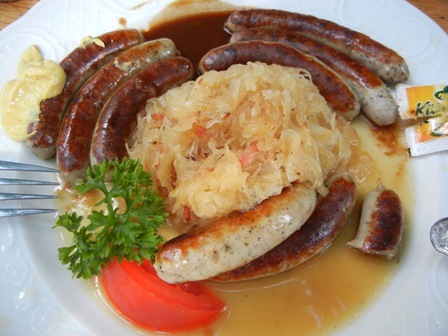 very good for a sensitive stomach. It meant home to me somehow, or as we Germans call it “Heimat”. The service was very good. 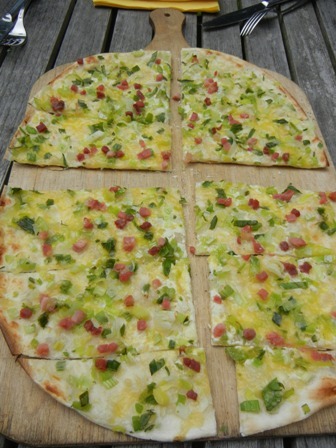 We ordered “Flammkuchen” (a traditional dish from the German Southwest and the French East -Alsace) which seems to have gained the upper hand when it comes to dishes one orders together with wine these days. You can see from the photo above that this was truly worth it. My tip: if you are in the vicinity, drop in. There is a great choice of wines, not only local ones but many more from around Europe. And enjoy. Tel. : +49-22 23 – 30 10. 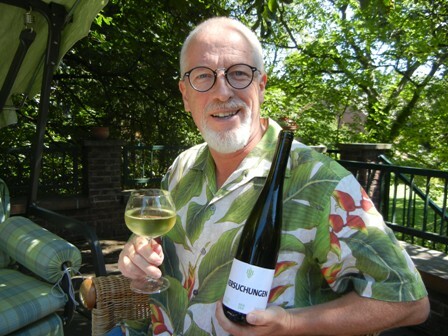 The wine is made by Andreas Bender, a contrarian of the German wine scene, of Weingut Bender. 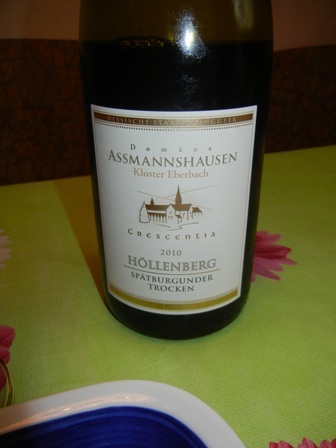 It is a semi-dry Riesling, usually not a wine style I very much like. 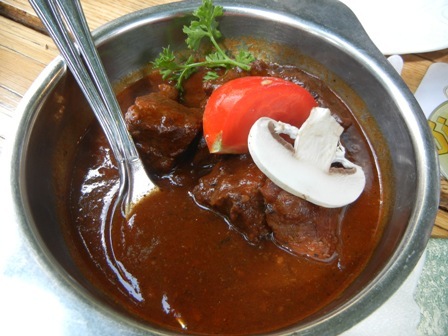 But it perfectly machted the spicy Asian soup we had it with. 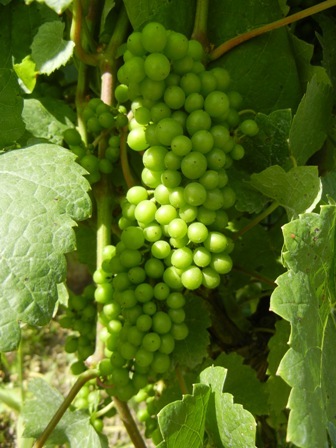 Lovely buquet, fine acidity and a sweetness which was round and compassionate, like a kiss. The wine is named in allusion to two quotes by Oscar Wilde, who must have said that “I can resist everything, except temptation” and “The only way to get rid of a temptation is to yield to it”. I yielded to it as well. 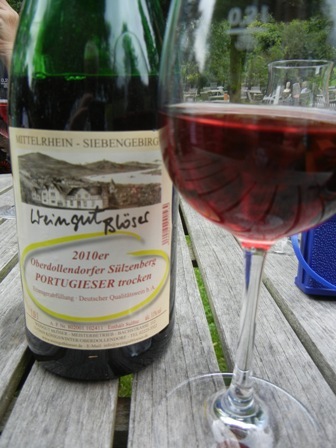 It was modestly priced at Euro 7.50 when I bought it at Weinsinnig, one of my preferred wine barS in My home town Trier. I have not made up my mind about this wine. I need to taste some of the dry wines Andreas Bender produces before I can come to a conclusion. But for the many off-dry wine lovers, this wine is a true temptation. 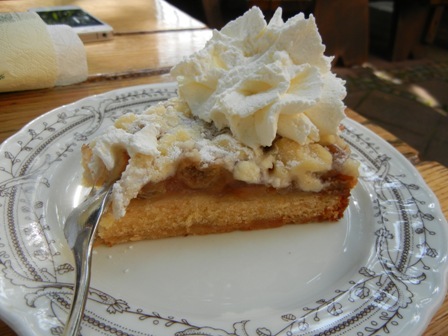 You are currently browsing the The Man from Mosel River blog archives for August, 2012.